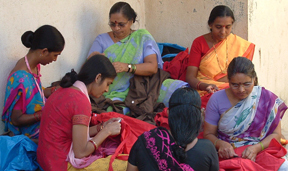 Since 2004, Marigold has been working with a sewing co-op of over 300 women from the slums of Mumbai, India. The co-op provides an opportunity for severely disadvantaged women to craft their own economic independence by learning sewing and embroidery skills. After 6-9 months in the training program they join one of the 18 work groups which are autonomously run and coordinated by one woman whom is elected by each group.The women are also offered a number of social services including childcare, a nursery, educational sponsorship for their children, health training and a savings and credit organization. Marigold first discovered the women’s co-op at the World Social Forum, an international conference of over 100,000 people representing the grassroots community from all over South East Asia and the World. At the time, the co-op was creating children’s toys but was interested into moving more into fashion, and as supporters of fair trade we had often found it difficult to find fashionable fair trade clothes in the North American market. We feel that meeting this group was in our destiny and saw a perfect opportunity to help grow the industry of ethical fashion by being using a Wholesaler model. The women at the heart of Marigold are in India, but Marigold helps bring their skills and traditional art forms to the North American market through the design of fashionable fair trade clothing and partnering with over 60 retailers around the country. Unlike the traditional garment industry supply chain where clothing designers in North America only outsource production to developing nations, never meeting any of the workers, and certainly never consulting with the p roduction staff, Marigold takes a different approach. 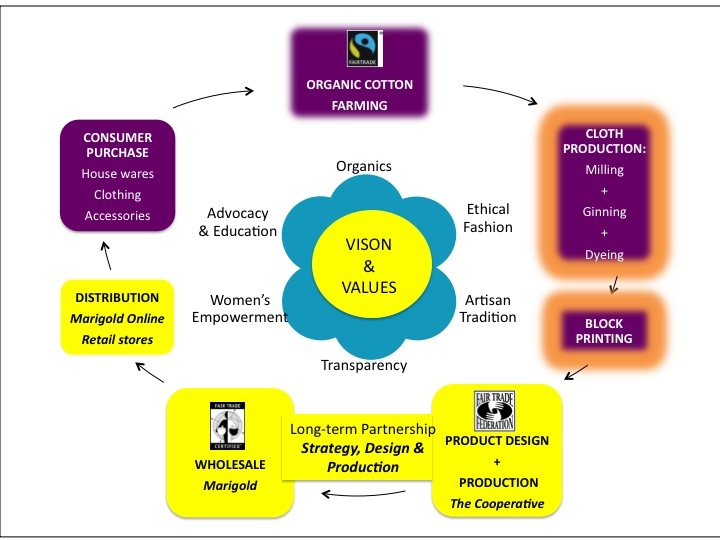 Not only do we consult with local Indian artists in designing our housewares and clothing, we also know the names and faces of the women in the co-operative who actually make Marigold products. Instead of seeing the production phase as merely a means to an end that we should constantly strive to drive down costs and margins, we see our workers as partners and members of the Marigold family. Stay tuned for the last installment in this series, one that our readers are most familiar with, Part 4: Distribution & Consumer Purchasing. How have your feelings about Marigold products changed since you have been able to put a name and face to one of the workers? Does having this insight prompt you to question the status quo of the garment industry? Entry filed under: Ethical Fashion, Fair Trade, Supply chain, Women. Tags: apparel, cooperative, fair trade, india, Marigold, organic, wholesale. 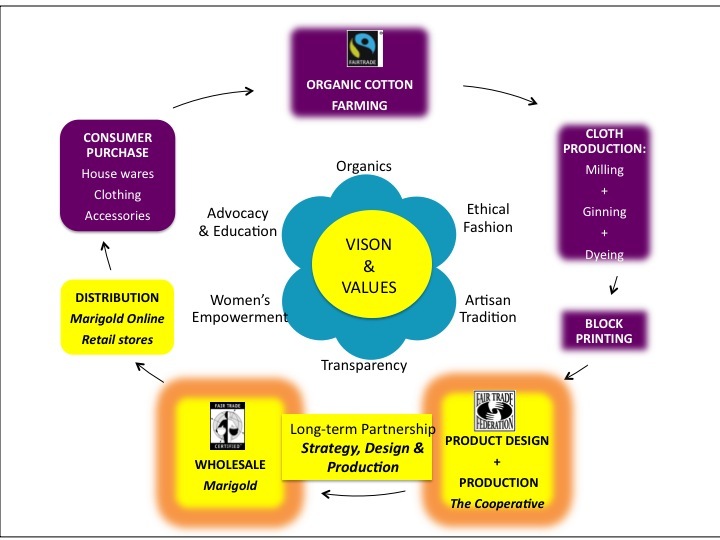 Part 2 of “Fair Trade From the Seed to the Consumer”: Cloth Production & Block Printing	FREE FAIR TRADE FRIDAY Giveaway: Win a beautiful organic denim skirt!